We were deeply saddened to hear this morning that Brian has passed away. Many ribs and way too many martini with martini chasers were enjoyed alongside his wit and fine humour. Our deepest condolences to his family. 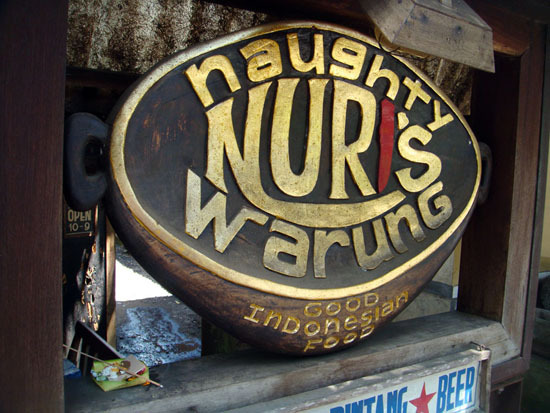 Roadside shack Naughty Nuri’s is an Ubud institution, open since 1995 and famed for its melt-off-the-bone pork ribs and knock-down-dead martinis. 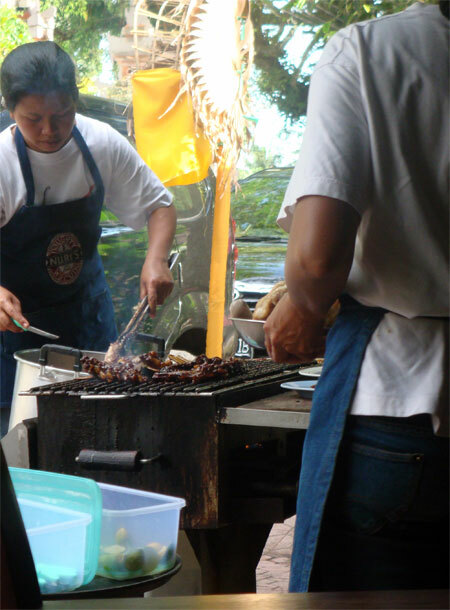 Nuri, the Indonesian half of the pair that set up the restaurant, is responsible for the delectable spare ribs (around 80,000 rupiah), an absolute must-have if you’re staying in Ubud and even worth a drive up from Sanur if you’re staying there. The ribs are simmered for hours before being tossed onto the barbecued out the front of the open-air restaurant, smothered in a secret sauce. Order a simple side salad and a side of hand-cut fries. 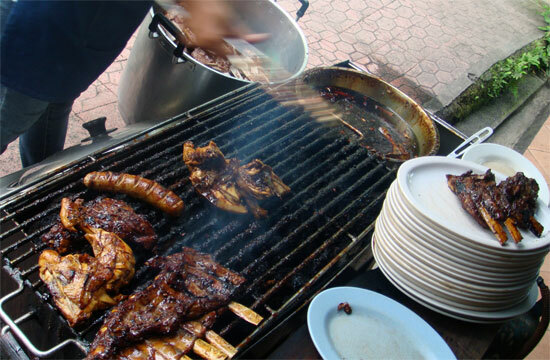 A selection of Indonesian dishes and other meaty-cheesy Western standards are on offer as well. We’ve taken visitors to Nuri’s too many times to count, and only once have the ribs disappointed. It was a busy night and we were about the last table to order. Later an exhausted waitress slumped down on a chair at the table next to us. She told us our ribs weren’t as good as usual; she apologised and said because they’d been so busy they hadn’t been able to prepare them for as many hours as normal. Moral? Don’t go too late. The place gets packed, particularly from large Javanese family groups, so try to get in early. But not so early as lunch, we’d say, if you plan on a drink or two, else you’ll lose the rest of your day*. Brian, the New York half of the Naughty Nuri’s equation, will be the one to blame for your headache after a night on the martinis, margaritas or cosmopolitans they serve up here. These are the most serious cocktails on the island (around 100,000 rupiah). You have been warned. Waitresses will shake your cocktail table-side, ordering you to sip the near-overflowing glass so they drip every last drop into your glass. And just that sip, trust us, will leave you buzzing. There’s a saying about martinis being like breasts: One is not enough and three is too many. Nowhere is that more true than here, where the alcohol is exceedingly, even mysteriously, potent. Cleanliness at Nuri’s is not exactly a priority; expect the floor to be littered with paper napkins and the occasional rat darting across the roof rafter as well. A few hundred metres down the road is Nuri’s less-grotty Nacho Mama’s grill, where the menu is Mexican and the drinks are just as lethal. The nachos are good, the pork chop — which sounds dull — is out of this world. 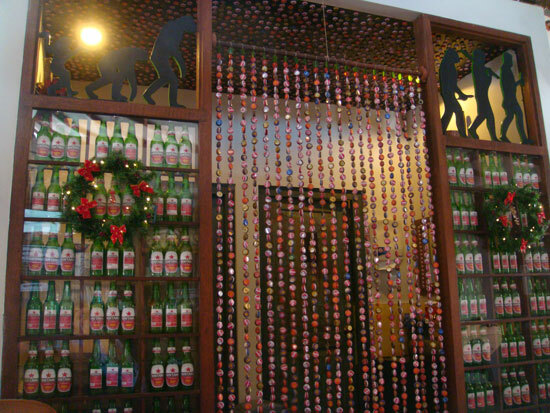 The bathroom at the new Naughty Nuri’s. You may be using it. As well, last year a sort-of franchise opened in Canggu, with a similar main menu but an ever-so-slightly upmarket feel, though the vibe is kind of dark-woody-casual similar. * This is the reason there are no photos for cocktails. They’re all blurry.